I’ve been using the WebdriverIO testing framework for the last eight months and have had an incredibly positive experience, so I want to share the love. If you are looking for a new testing framework, here are a few reasons to consider WebdriverIO. Also, WebdriverIO makes it super simple to find elements. Outside of searching for elements by only the text they contain (e.g. button=Save), WebdriverIO allows the use of advanced CSS selectors (e.g. #editSomething>span #someElementID, or #elementId>h3:nth-of-type(1)). This means there’s no need to rely on the pesky xPath and accidentally selecting duplicate elements is no longer an issue! 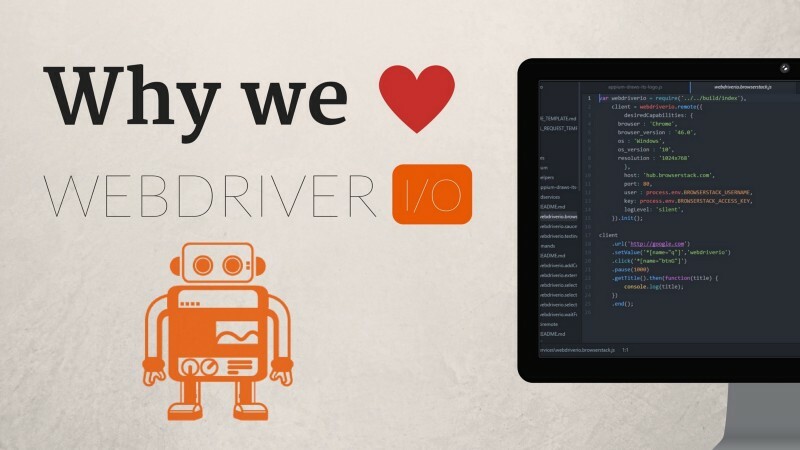 WebdriverIO supports other testing frameworks like Jasmine, Cucumber, and Mocha. I used Mocha because the configuration helper kindly offered it to me, and I’ve used it before. Not only that, you can set global variables, arrange scripts into suites, and set the number of browser instances. I’ll dive deeper into these options in a later blog post. If you’re still doubting the framework’s friendliness, check out this awesome Gitter channel where WebdriverIO devs and users hang out, share knowledge, and help one another. The best thing about WebdriverIO and Selenium working together is that checks run in a broad range of browsers (the sorts that have drivers, that is), like Firefox, Chrome, Safari, and even IE. This makes cross-browser checking SO much easier. The commands used in WebdriverIO checks are short, succinct, and pretty intuitive. I haven’t needed custom commands yet, but it’s good to know that they’re available if necessary. That way, if anything changes in the Account/Login page code, I can refactor my account.js helper function, and I’m done. When I was starting out, I didn’t really understand the Page Object Model but have since decided to give it another chance. Since it seems like helper functions do pretty much the same thing — reference an action and keep it separated from the checks — I’m not sure if I should switch to Page Object Model. If anyone has some good arguments for why the Page Object Model is a better choice, I’d be very interested in hearing them. I hope you find WebdriverIO as valuable as I have. If you want to play with it some more, check out this GitHub repo to see the examples from this post and a few extras that will be the topic of my next post (repo in progress). Happy Testing! Originally posted on our partner blog at East Coast Product .